When I go on the mount you call Baroull, and, but turning me round, can see England, Scotland, Ireland, and Wales, I think shame so fruitlessly to see so many kingdoms at once (which no place, I think, in any nation, that we know, under heaven can afford such a prospect), and to have so little profit by them. has subsequently been more usually applied to the higher Snaefell (South Barrule is considerably more convenient to Castletown and was a 'watch and ward' lookout). It is the answer to the often posed question as to where can one see seven kingdoms at the same time ? The seven Kingdoms being the four mentioned by Earl James, the Kingdom of Man, of Earth (in some answers that of Neptune) and of Heaven. Wordsworth was obviously familiar with the unpredictable weather by which Snaefell can suddenly be enveloped in mist out of a clear blue sky! He also quotes Cowley's setting on this mountain of a visionary debate with an angel on the subject of Cromwell's governance - presumably being set here because it was at the centre of Cromwell's territorial ambitions. Barometer at every 2 ft. (ascending) , falls 10th of an inch, and at 164 2/10ths. July 10th, 1702, at Bishop's Court, 29 4/10ths. On the mountain above the house, it fell 1 inch 1/10th. On Snaefield, 2 in., acc. tis therefore 564 yards." [I'm not sure I fully understand Bishop Wilson's calculation (or possibly Keble's transcription ]. As his biographer, Keble, notes this process was then comparatively new, having been made known first by Halley, the Bishop's contemporary. Fannin in his map of 1789 quotes a height of 580 yards (1740 ft) above the sea level - this he probably arrived at by personal observation. Berger in his geological map of 1814 gives a height of 2000 ft (which was copied by Smythe in his 1826 and thus further copied by many others) - it is possible that this value was that determined by the original triangulation of the Ordnance Survey which used Snaefell. Cary in 1816 quotes 2004 ft, though on what authority I have not yet determined, which value found its way into several guidebooks. In 1838 the retriangulation of Great Britain by the Ordnance Survey took place and although they used South Barrule they would have redetermined the heights of the major mountains. In 1861 Stanford uses a value of 2024 ft which was then replaced by the 2034 determined by the Ordnance survey of 1868. 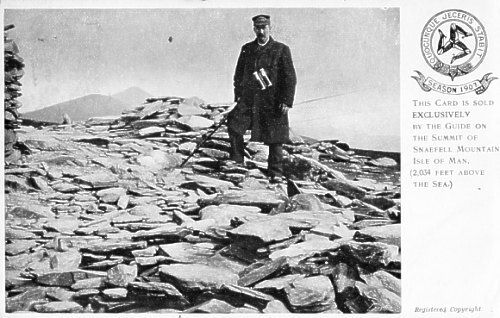 Pilgrimages to the top of Snaefell obviously have a long history judging from the Lonan presentments quoted by Moore. Possibly the first luxorious 'picnic' on top was that organised by Mr Dixon of the British Hotel, Douglas, to celebrate the end of the Napoleonic Wars - another such visit was described by John Welch in 1836 - Leech's 1861 guide gives a good account of pre-railway visiting. The opening of the Snaefell Mountain railway in 1896 made it one of the standard tourist resorts. The castellated building shown on this card replaced a plain wooden building in 1906 - it burnt down in 1982 and was replaced by a much plainer building. All food etc. for the public house had to be taken up by trailer cars on the railway. The rustic seat was visible on an earlier view and may have been part of a job lot as the Laxey terminus had several huts in this style. Naturally at the summit the tourist could buy special cards - this is the one for the 1907 season "Sold exclusively by the guide on the summit..."
The postbox for the cards can be seen to the right of the viewing platform - the fee for which was 2d to use the telescopes. The postbox would be emptied just prior to the last tram and its contents passed onto the Post Office in Douglas. The viewing platform was a later addition - this card shows a group of tourists on a typically windy summit.